The publisher sent me an e-galley of this book. 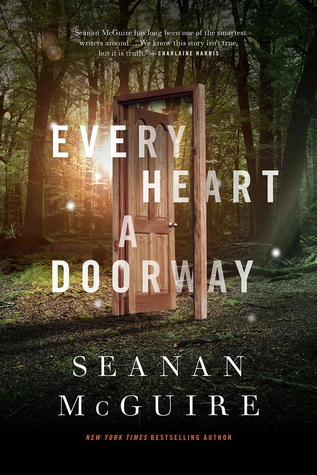 Just like I like Mary Robinette Kowal’s stories for talking about the bit after the falling-in-love stage, and shows that married life can be worth stories, Seanan McGuire has presented a story about the girls and boys who come back from fairyland… and wish they hadn’t. Nancy went to the Halls of the Dead and basically learnt to act as a statue to please the Lord and Lady there. Her parents, of course, do not understand what she experienced and think she needs to be helped through whatever trauma is causing her to tell such dreadful tales. I’d never really thought to consider what Alice’s parents or friends might have thought… although Swift does have Gulliver deal with some repercussions of his travels and travails (these two go together in my mind because of a uni subject that made me read both). Fortunately for Nancy, Miss West has a school specifically for people like her; those who have gone to other places and desperately want to go back, because that is home. Which sounds all well and good and like you’re going to meet people with whom you have lots in common… but not all fairylands are alike. In fact McGuire does marvellous work of sketching out how such places might be categorised, including the difficulty of ever really categorising such places, and if the place that felt like home to you was all about stillness and silence, how much do you actually have in common with someone who went to a land called Confection filled with light and colour? Yeh, adolescents have a hard time finding anyone they can actually connect with. While simply telling a boarding-school story with such a bunch of misfits would probably have been enjoyable of its own, McGuire decides to hit them with problems as well – murder, to be specific – to play out the ramifications of trust issues, insecurity, and bonding under duress. And I haven’t even mentioned the fact that not all of the characters are heteronormative. McGuire has created a fascinating world here, and much as I would like a series of boarding-school books set at Miss West’s, somehow I think that might hurt the magic. This is a wonderful novella and I’m glad it found a home with Tor. It comes out later this year. ETA: turns out it comes out in April 2016. Sorry! I’ve heard amazing things about this story from Lee Harris, and do want to read it. It’s in my Possibly for 2016 Hugos list.